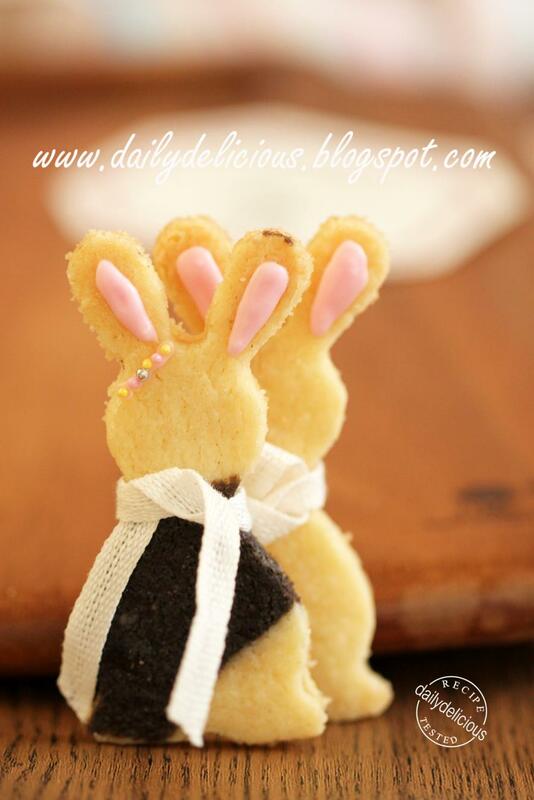 dailydelicious: Bunny Shortbread: Who say you can't play with "Cookies"? Bunny Shortbread: Who say you can't play with "Cookies"? 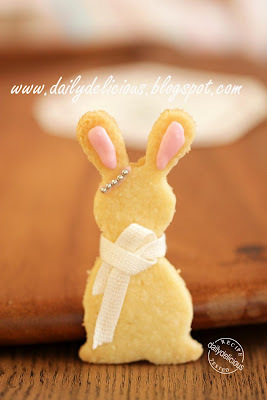 There are moment that I just want to play, ^^, and you can guess I always play with my food (who say you can't!!!!). Making cutout cookie is something I choose, it's both fun and delicious. 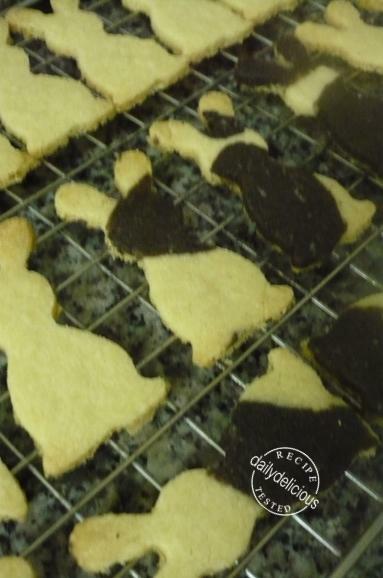 It can be tempting to make a lot of shape, but when making cutout cookie, one thing that you have to remember is the baking time for each size will be varied. I made this same mistake before, and my cookies came out of the oven in different stage of baking, some pale, some overbaked. This time, I really resisted my desire to use many shape (I love to collect it, haha, so when I want to make cutout cookie the most time consuming process for me is "choosing the cutter", ^^"). But if you want to use many size (and style) put the same size in one baking sheet and bake them at the same time, it will give you more control. 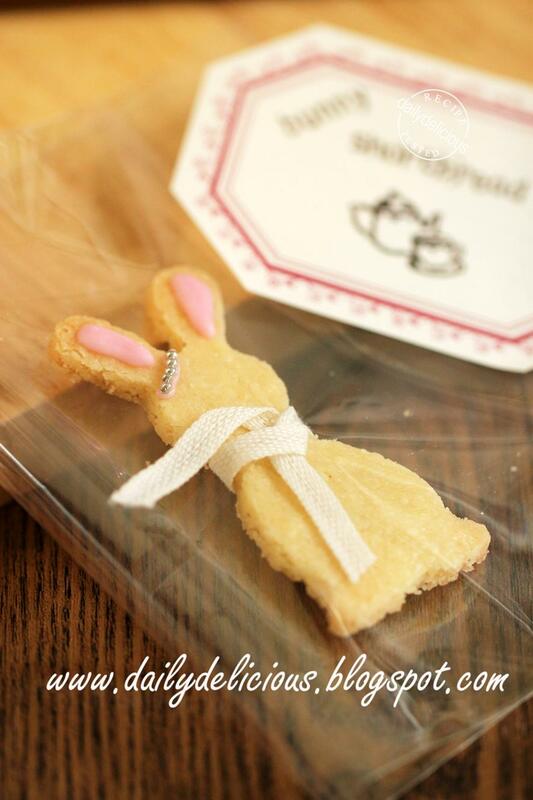 This cookie is rich and buttery, but very fragile, because it contains rice flour, and a lot of butter. Due to the butter, you may need to refrigerate it many time until you complete your cutting work (but the weather is very cold, it will be easier). There's a little problem that I got, my cookie spreads after baking and if you facing it, you can use my trick, just cut the hot cookie with the same cutter again. Beware of the burning, but getting lovely and uniform cookies will make you think it worth playing with something this hot! For the decoration, it's really up to you ^^, because playing is my plan. 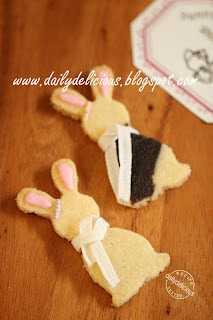 You can follow my idea of adding a brown spot for your cookie, or leave it plain. So I ended up with 2 kinds of bunny, golden and brown spot. I decorated mine with a bit of royal icing. 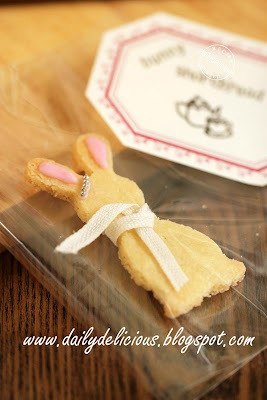 I didn't use a lot of it because I don't want to add more sweetness into my lovely cookie, and use the ribbon to decorate it. Now, my cookies are ready to be enjoyed or used as a gift, ^^, may I ask where are yours? Put both of the flour, caster sugar, and salt in the food processor, process to combine. Put half of the butter with the vanilla extract, process to combine, add all of the butter process until the dough just start to form. Warp with plastic warp and refrigerate for 1 hour or until firm. 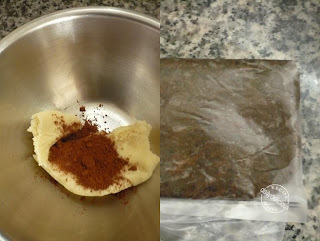 If want to make brown spot, use about 1/8 of the dough and mix with cocoa powder (½ -1 tbsp)and brown food coloring. Prepare the baking pan by line it with a baking paper or silicone baking mat. 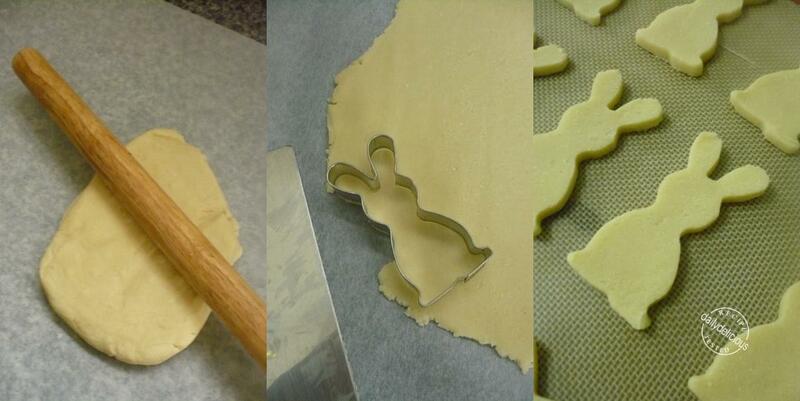 Roll the dough until about 5mm thick and cut into shapes. Place on the prepared sheet pan and chill for 1 hour. 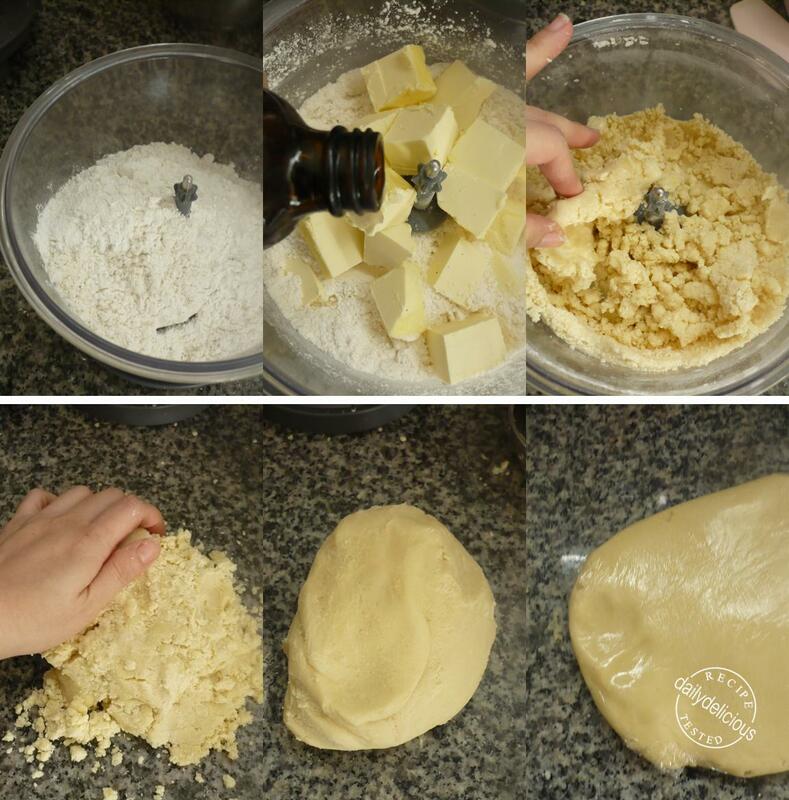 *If making the brown spot, roll the cocoa dough into small ball, patch and press it onto the vanilla dough. Bake for 15-20 minute or until just turn golden. My compliments to the baker! If only the scarf is edible, that would make the eating easier. 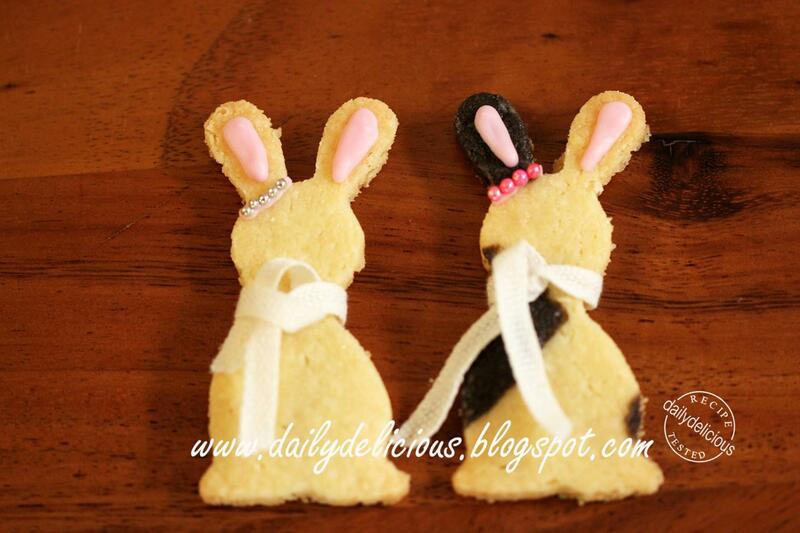 You are such an amazing baker.......I am always mazed by your bakes & pictures. Oh they make you smile too. Where did you bought the cookie cutter?? I bought it from Paragon Department store, in Bangkok.